This effective cream contains precious ingredients from organically grown pomegranate and golden millet. It helps reduce the appearance of wrinkles, tautens the skin and reactivates skin regeneration. Dermatological tests shown that after 28 days of use depth of wrinkles reduced by 23%*. 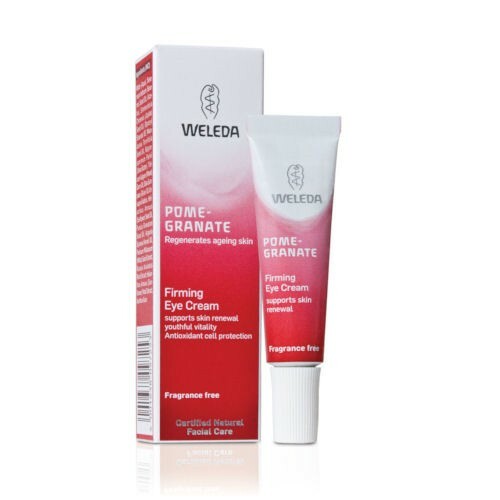 Weleda Pomegranate Firming Eye Cream is a gentle, but effective companion to help regenerate skins natural ageing process. *Measurement of depth of wrinkles with PRIMOS, test with 22 subjects in 2009, age: 41 - 69 years. (INCI) Water (Aqua), Sesamum Indicum (Sesame) Seed Oil, Alcohol, Simmondsia Chinensis (Jojoba) Seed Oil, Glyceryl Stearate SE, Macadamia Ternifolia Seed Oil, Butyrospermum Parkii (Shea Butter), Triticum Vulgare (Wheat) Germ Oil, Olea Europaea (Olive) Oil Unsaponifiables, Helianthus Annuus (Sunflower) Seed Oil, Punica Granatum Seed Oil, Argania Spinosa Kernel Oil, Panicum Miliaceum (Millet) Seed Extract, Ruscus Aculeatus Root Extract, Helianthus Annuus (Sunflower) Petal Extract, Xanthan Gum.